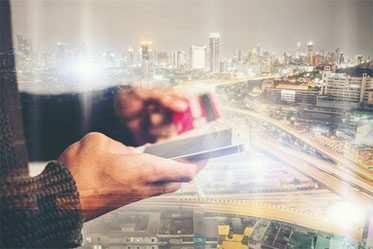 A Bulk SMS provider allows Australian businesses to send and receive mass text messages through leading telecommunication networks including Optus, Telstra and Vodafone through an online platform which connects to a CRM, database or custom API solution with bulk volume leading to discounted prices. View the bulk text message Australia providers updated on 28/03/2019. What Is A Bulk SMS Service? Learn about sending text messages overseas through international SMS providers. Learn about the SMS software used by providers to integrate with businesses. Learn about the SMS gateway service that delivers text messages rapidly. 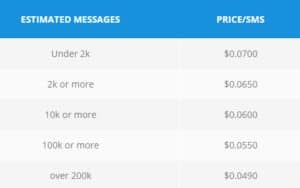 How Does ClickSend Bulk Text Message Pricing Compare? ClickSend provides a very competitive pricing schedule for Australian businesses with the prices of outbound SMS messages shown to the right. All inbound text messages are free with the provider. There is an additional fee for bulk SMS services associated with a dedicated number. This costs $19 a month with no setup fees. A provider can also choose their own number when available. Getting a dedicated number also only takes minutes with ClickSend. All prices shown on the table to the right and the ClickSend website excludes GST and are in Australian Dollars. When the ClickSend prices were compared to the other Australian bulk text message providers, the findings indicate that their offer is one of the lowest costs. When comparing the pricing schedules for a range of Australian bulk SMS providers, the price variance can be as high as 60%. This variation can be based on the networks (grey vs major providers) and service level agreements offered by the provider. It can also be based on set-up fees, contract duration requirements and other fees charged on-top of usage. It should be noted that Clicksend has no contract or set-up fees. Two-way SMS service, where both an SMS is sent and received, also have no additional charge. This means that it can reduce overall text messaging costs as some providers charge for each text message received for such type of communications. Overall, ClickSend charges that are advertised are extremely competitive at most usage brackets compared to their competitors. This is also reinforced with large batches of text messages where ClickSend is prepared to discuss possibly of matching against any other bulk SMS providers to win the business. If course, such cheaper pricing is based on comparable volume. ClickSend ensures that their prices are regularly checked against competitors and adjusted so customers always get the best deal. They state they will beat any cheaper quotes. Is ClickSend Suitable For Premium SMS Requirements? While ClickSend offers the lowest prices (as proven by their price beat guarantee), they also present the best service level agreement (SLA) of 100% up-time guarantee. The 100% SLA provides confidence to both Australia companies and the large global companies to become clients of ClickSend including Uber, Siemens and Intel. They also have a high capacity network ensuring that critical time-sensitive text messages are delivered promptly. This network is not only Australia-wide but globally allowing for international SMS delivery leading ClickSend to be one of the leading bulk SMS providers. 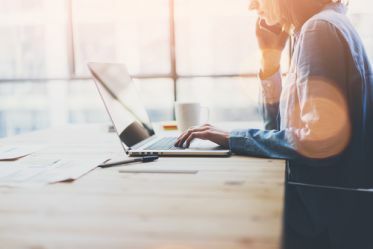 When it comes to bulk distribution and the use of reliable gateway service, it can be seen that ClickSend provides a high-speed, premium connection through their direct telecommunication carriers rather than using both direct and hybrid carrier networks. Their gateway routes are through Optus, Vodafone and Telstra. The SMS Gateway capacity is able to match major SMS firms with over 7 million text messages delivered weekly. ClickSend states that text messages are delivered within a matter of seconds with an SMS gateway uptime of 100%, which is a real asset compared to other similar bulk providers. The Web SMS option allows companies to send bulk SMS messages from their PC with no software download requirements. All the core features to send text messages exist with individual or mass text message options available. For mass SMS campaigns a business just needs to upload a contact lists online and a large-scale SMS distribution can commence. Businesses that have their own CRM software or messaging infrastructure the SMS API may be the optimal solution. The SMS API integration is relatively easy allowing firms to automate messages using the company’s existing software systems. The SMS API can be accessed using the majority of programming languages with a SDK in PHP available on their website. The Email to SMS gateway is compatible with Microsoft Office or Apple Mail. Using these e-mail packages SMS marketing campaigns or even SMS reminders can be send which include free deliverable reports. No extra software is required to use this method with users just requiring to forward the message to the number in the subject line. ClickSend head office is based in Perth, Australia. There is no need to visit the location to setup an account with a 1800 number operating on a 24/7 basis. This is much more superior than other similar type of SMS bulk providers who either offer a 1300 number or available only during business hours from Monday to Friday, unless an additional payment for out of hours service. It’s worth noting that ClickSend may appear to be a cheap ‘no frills’ provider but they do have all services equivalent of what appears to be more premium providers with a lower per unit text message cost. Their customer service personnel are well trained and will provide all the technical assistance for developers setting up their SMS campaigns or an SMS API. Some bulk SMS service providers offer SMPP (Short Message Peer-to-Peer). This protocol used by the Australian telecommunication providers allows exchanging text messages between Short Message Service Centres and External Short Messaging Entities. This protocol is level 7 TCP/IP and can minimise latency of text messages sent. Version 3.3 SMPP is the most widely used within Australia while version 3.4 has transceiver support allowing 2 way SMS solutions. Australian companies are quickly learning the benefits of using a mass SMS service within their organisation. Bulk text message services are most commonly associated with SMS marketing and communication campaigns, providing special deals to customers who opt-in to receive special deals and alerts. More recently, governments and councils have discovered the immediacy and cut-through of SMS when used as an information tool. With Australia’s diverse weather conditions, it became apparent that a reliable and scalable alert system was required. SMS provide to be more than just a mobile marketing solution. With the ability to reach hundreds of thousands of mobile phones on multiple networks with seconds, mass SMS has quickly become a trusted and reliable tool used by hundreds of councils and authorities across the country. Purchasing SMS in bulk is an effective method of keeping the overall per message cost to a minimum. Most mass SMS providers will offer very low rates per SMS when you make a bulk purchase, allowing you to use as many or as few SMS per send without the worry of an expiration date. For this reason, organisations from gyms and social clubs through to online services prefer to purchase their SMS in bulk and keep their customers and consumers happy with regular offers and updates. A number of Bulk SMS Australia service offer a trial session where you can see the way the whole text messaging service process transpires from start to finish. There is a range of free trial offers ranging from a time period of 14 days available from Burst SMS to a free trial through a number of SMS, whether it is 5 SMS to 50 SMS. Other bulk SMS providers do charge such as Nexmo with a minimal cost of two euro to international company. MessageBird does not offer a free trial period. By checking Bulk SMS Australia providers’ websites, you will see what free trial they offer. Bulk SMS Australia companies provide a range of featured Business SMS platforms for sending text messages to customers, clients or employees in a cost-effective, efficient and secure manner. They can be sending a SMS online, importing contacts and managing lists of customers and staff. 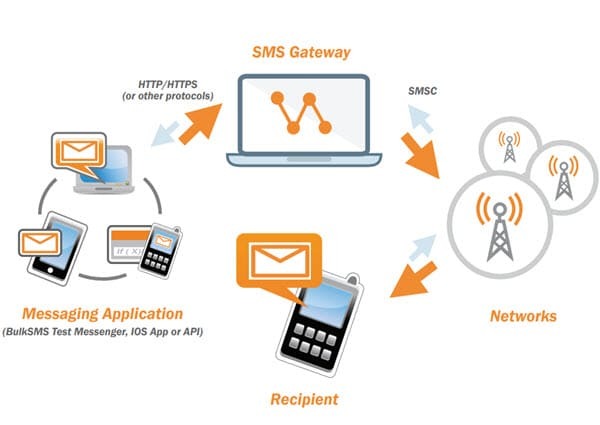 Bulk SMS Australia services are able to integrate their SMS gateway with your website or software using SMS API tools and add text messaging to your business workflow. Business SMS services that are also offered by Bulk SMS Australia providers include two-way, online text messaging chat, which is ideal for remote communications and using dedicated SMS numbers to receive inbound SMS and replies to your text messages from customers and employees. Overall, international bulk text message prices vary by region so don’t expect a universal price for delivery. It’s best to request international SMS prices and compare quote prior to finalizing the provider for your business. SMS is very effective as a marketing tool for reaching out to large numbers of present and potential customers through Bulk SMS Australia providers. SMS messages are more likely to be opened when received or within just five minutes of being received. This makes SMS marketing a reliable form of communications particularly for marketing campaigns, promotions, contest, and appointment reminders, as some examples. Through the engagement of Bulk SMS Australia companies, you can evaluate how to improve your campaign or promotion by reviewing detailed reports that will assist you to boost better responses. SMS marketing can assist in organizing campaigns creations, automated personalization and unsubscribed management. Bulk SMS also known as Bulk Messaging allows a large number of text messages to be delivered through mobile carriers. This is primarily used by businesses looking to communicate to existing or prospective customers due to the 98% open rate of SMS messages. 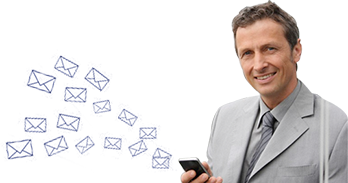 Bulk SMS providers software allow integration with CRM, e-mail or databases. Last year there was an option within Google (settings>labs) that allowed free SMS from Gmail through chat (see below). This option was removed and unless you had it enabled no free service exists. Instead to send bulk SMS from Gmail a paid mass texting service provider such as Clickatell, Clicksend and Direct SMS is required. These gateways can plugin through Google Apps to Gmail contacts, dates and other information and send text messages. Rules can be set to determine and customise these bulk SMS messages. There are two services that offer free SMS services. The easiest and simplest site is A Free SMS which you can put in an individual number, the message and it’s sent at no cost. The second site is AFreeSMS which has advanced functionality such as scheduling but you need to complete surveys and other tasks to get credits used for an SMS. It remains free when using A Free SMS but these tasks to get points do take some time to complete which should be factored in. A bulk related program is able to use a specific short coding method to be able to distribute large number of text messages to mobile phone or mobile devices when required. This can be done within a specified period nominated by you. Because such program platforms has such a capacity to send messages promptly it is used, it is highly recommended for large volume distribution with regard to marketing and communication campaigns. To register, firstly review the range of bulk SMS providers’ websites available in Australia (and overseas), using the bulk SMS Comparison Table or just surf the Net. If interested, you’ll see each provider has an information section and an email address for you to register. Consider requesting a free trial to test their features before committing to that SMS bulk provider. By using a bulk SMS approach, you are able to send large number of a text message at any time, whether it is sent nationally or internationally. Bulk SMS is an ideal tool for businesses, large or small, who want to be assured that they can reach their target audiences effectively. Most mobile phone users read their text messages within 2 minutes of receiving them. Every SMS service provider in Australia uses an SMS gateway to send SMS from one point to another point whether it be to individuals, clients, customers or/and organisations. A SMS comparison table has been developed to identify and compare the services and products offered by these SMS providers by means of an independent yet well analysed SMS Bulk Comparison Table. The information has been summarised into a simplified, readable, and easy to follow tabulated format so as to provide you with key information on selection criteria such as message distribution costs, networks availability, composing online to single and bulk recipients, credit availability, service support and so on. It should be stressed that the information provided in the table should only be used as a guide as prices and features may be updated at any time by the SMS Gateway providers’ websites without any prior notification. This table also originally had Burst SMS, SMS Broadcast and Clicksend but they did not make the short-list to five providers. After working with SMS providers over several years, the authors of this site understood how time consuming comparing providers was. To simplify the process, a set of criteria was created to suit most Australian business’s needs. While ideally exact prices would be provided, the way the industry has moved with negotiated rates meant only a rough guide to costs could be provided. The information on the table came from the Australian text message websites. 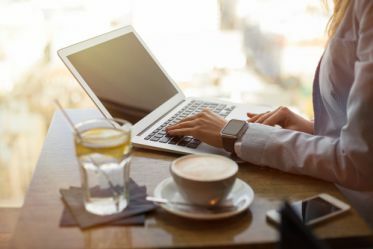 In some occasions the providers were contacted to verify information and some providers recommended provide an affiliate payment for traffic to their inventory. We also have a how to guide and a company guide on our site. A comparison of Australian Bulk Text Message Service Providers.